Taken from the Topeka Capitol Journal Friday-March 7, 2003 edition. Lenwood G. Holo, 64, is preparing a tribute to custom harvesting -- a profession that was born nearly 60 years ago but has lost operators in recent years because of drought, sluggish commodity prices and rising expenses. Holo has refurbished a 1949 Massey Harris 21A combine -- found last year in a patch of trees on a rural Nebraska farm -- to commemorate the first harvest brigade in 1944. The restored combine will run and operate with the custom harvesters' route in 2004 along with a restored two-ton truck, a pickup truck and a travel trailer from the early '40s. "This was an actual dream," Holo said. "It was so real I couldn't get rid of it." Holo, whose business card titles him "the combine man," is displaying his restored combine at the U.S. 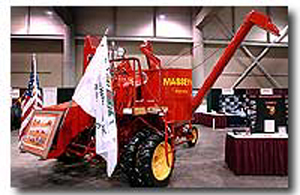 Custom Harvesters' annual trade show at the Kansas Expocentre. The doors were widened in Exhibition Hall to accommodate the combines for the trade show, said Linda Briden, sales manager for the Topeka Convention and Visitors Bureau. The show runs through Saturday. U.S. Custom Harvesters started in 1983 in Texas and moved its headquarters to Hutchinson in spring 2002. Dave Hermesch, president of U.S. Custom Harvesters, said members who have been in the harvesting business for more than 35 years say 2002 "was the worst year we've ever had." Harvesting companies lost tens of thousands of acres that they would normally harvest because of drought. Some parts of western Kansas and Nebraska were about 10 inches below normal in precipitation in 2002. "It was devastating to everybody," Hermesch said. He estimated that the average custom harvester lost $100,000 in revenue last year. "We can't absorb that every year," he said. U.S. Custom Harvesters, which has about 700 members, recently lost 15 members because they quit the business or went broke, Hermesch said. "Too many are being forced into bankruptcy," Hermesch said. A typical custom harvester may have $500,000 invested in equipment, plus they incur annual expenses like insurance, fuel, labor and maintenance. Liability and workers compensation insurance have gone up, too, he said. U.S. Customer Harvesters, a nonprofit organization, is seeking insurance to recoup fixed expenses if an operator loses harvest acres to a natural disaster. Hermesch said Sen. Sam Brownback, R-Topeka, and Rep. Jerry Moran, R-Hays, have been supportive of this new type of insurance. Another issue facing custom harvesters is foreign labor, which Hermesch said is necessary in order to find qualified seasonal help. He estimated that more than 3,000 laborers come from countries like New Zealand, Australia and South Africa to the United States every year to assist custom harvesters. Before 9-11, U.S. officials weren't so strict if foreign workers stayed beyond their visa, but now if they make that mistake they can't get back into the country, said Tim Baker, operations manager for U.S. Custom Harvesters Inc.
Holo's passion for custom harvesting began as a boy growing up on a farm in North Dakota. He was a boy when the first harvesting brigades roamed the central plains cutting wheat. 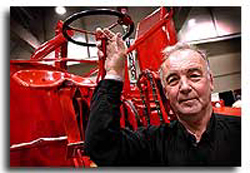 He worked the harvest run in the late 1950s with a 1949 Massey Harris 21 combine. Memories of life on the road, working on the machinery, long hours in the sun and camaraderie with farmers have remained with him, though he left harvesting in 1960 to work in the Air Force and then worked for many years on heavy-duty trucks. Holo normally lives in Eau Claire, Wis., but, in recent months, has been working for a Blair, Neb., truck parts company, using a friend's shop and living in Omaha. He purchased the 1949 Massey Harris 21A in June from Roger Serverig at Martell, Neb., south of Lincoln. "I had four like it but this one is 90 percent original," Holo said. Jerry Howard of Mount Hope provided a parts book. Holo, a skilled mechanic, would get lost in the restoration work for hours. "This machine, to me, was immaculate," Holo said. Some of the sponsors of the Custom Harvest Tribute are B & D Truck Parts, AGCO Corp., Nebraska Land Tire, Goodyear Tire & Rubber Co., RDC Body Shop, Rustad Implement and U.S. Custom Harvesters. Holo said he is doing the tribute because he didn't think most people realize how much harvesters play a role in feeding America. Michael Hooper can be reached at (785) 295-1293 or mhooper@cjonline.com.